Subject: Meeting of Empowered Committee of Secretaries (E-CoS) with Office bearers of Staff Side of Standing Committee of National Council (JCM) on recommendations of the 7th Central Pay – Postponement – reg. 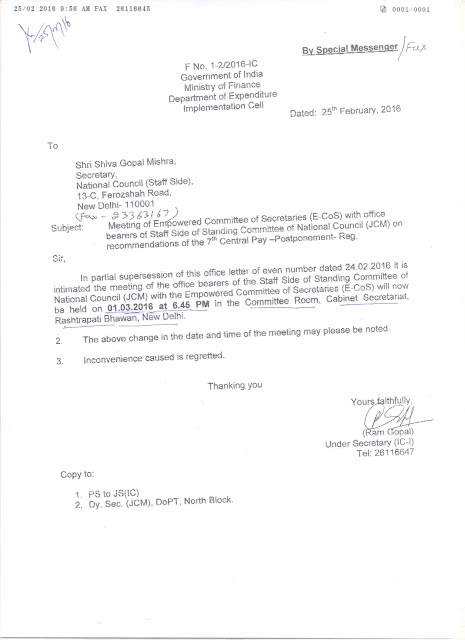 In partial Supersession of this office letter of even number dated 24.02.2016 it is intimated the meeting of the office bearers of the staff side of Standing Committee of National Council (JCM) with the Empowered Committee of Secretaries (E-CoS) will now be held on 01.03.2016 at 6.45 PM in the Committee Room, Cabinet Secretariat,Rashtrapati Bhawan, New Delhi. 2. The above change in the date and time of the meeting may please be noted.